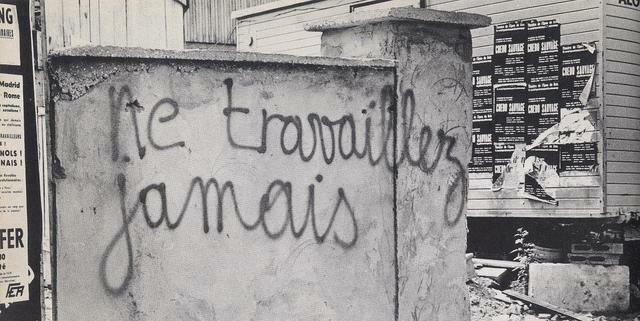 The Situationist inspired graffiti ‘Never Work’. Laid during a 1968 protest in Paris. Recent speculation has occurred about the potential for widespread unemployment as a result of artificial intelligence (‘AI’) replacing humans in the labour market.1 The concern is that as AI improves it will be to perform increasingly sophisticated tasks currently performed by humans at the same or lower cost. Advanced AI will also enable robots of the future to be more adaptive and capable. This kind of forethought is not unwarranted, especially in America where the introduction of new technologies since WWII has led to a decoupling of productivity and average real earnings6 and where employment is tied to benefits like health insurance.7 The potential numbers of people displaced from work because of AI could cause a dramatic social and cultural upheaval, not unlike that of the Industrial Revolution. On the other hand, many people lament returning to work after their holidays, especially after an extended break from work. This presents an interesting disconnect between the life most of us live (employed) and the life we most want to live (on holidays). Erik Brynjolfsson, an economist at MIT, has coined the term ‘Digital Athens’ for an Athenian-type return to leisure that AI could bring.8 But, this time, instead of a life of leisure built on the backs of slaves, AI and AI-related technologies could do most of the work that currently occupies our lives.9 Giving us the time to pursue what really interests us. There are some obvious challenges that must be overcome before the utopian vision of Digital Athens is realised. Most obviously, income and the distribution of AI-generated wealth. But rather than fearing the inevitable progress of AI or convincing ourselves that new jobs will replace the old ones (as occurred during the Industrial Revolution), our time would be better spent devising a scheme for the equitable distribution of AI-generated wealth. The other challenge associated with AI-related unemployment is the potential loss of meaning that many of us derive from working.10 To address this, we may return to some old ideas. The Situationists dreamed of a world where people did not need to work.13 Where humans could live a fulfilled life pursuing their true desires.14 Such a world may be possible with AI and AI-related technologies of the future. The Situationists believed that automation would make physical labour unnecessary. While traditional automation has certainly replaced some forms of physical labour, labour is still required because automation largely remains unable to deal with novel situations. Advanced AI and AI-related technologies promise to overcome this challenge through deep learning based on artificial neural networks. Could AI deliver a modified version of the Situationists utopia after all? Maybe part of the antidote for ennui caused by AI-related unemployment is to connect with our true needs? This could lead to a more meaningful existence and a life well-lived, which is what we all want.